It is very easy to install the gutter cleaning brush. The installation requires neither tools nor any modification to your roof or gutter. Step One: please clean the leaves/debris/waste water out of your roof gutter, and check the down spouts for obstructions. That will assure your successful installation and avoid the expensive fee for clogged down spouts. Step Two: Please fill your gutters end to end with the gutter cleaning brush, you can bend the gutter cleaning brush to fit around the corner of the gutter. If you find the gutter cleaning brush is too long to install in, you can fold it, but needn’t to cut it. It only requires two steps for installation, is it too simple? Thus, the leaves or large items can not drop into the gutter, small debris will be blown away or decomposed, as a result, the gutter will have smooth drainage. AOQUN can not only design the suitable gutter cleaning brush for your house, but also provide the installation. What are you waiting for? 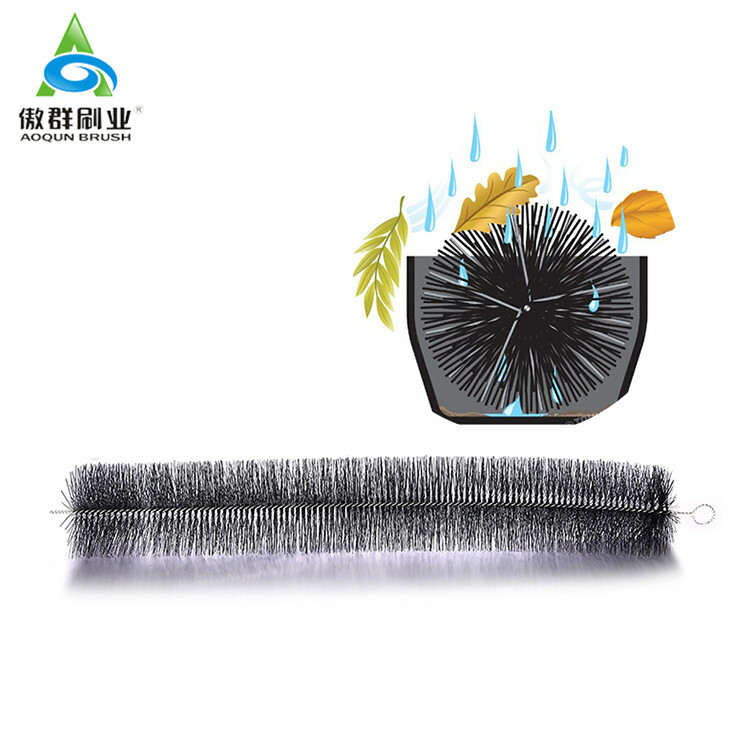 Hurry up to consult us about the gutter cleaning brush! We may be unfamiliar with the gutter worm brush in China, but it is in common use in foreign countries. You can see the gutter worm brush in the below picture. Some people may think it is the same as the ordinary brush when they give a glance to the picture. Yes, you are right, gutter worm brush is one of the twisted brushes. However, gutter worm brush has the specified diameter to suit almost every standard gutter of the roof, it is 3.25 inches in minimize, 4.25 inches, 5.25 inches, 6.5 inches and 8 inches in maximize. You can customized the length of the v according to your roof gutter.The installtion is so easy, you can just follow several steps, we will talk later in the other article. The roof gutter is clogged by leaves. 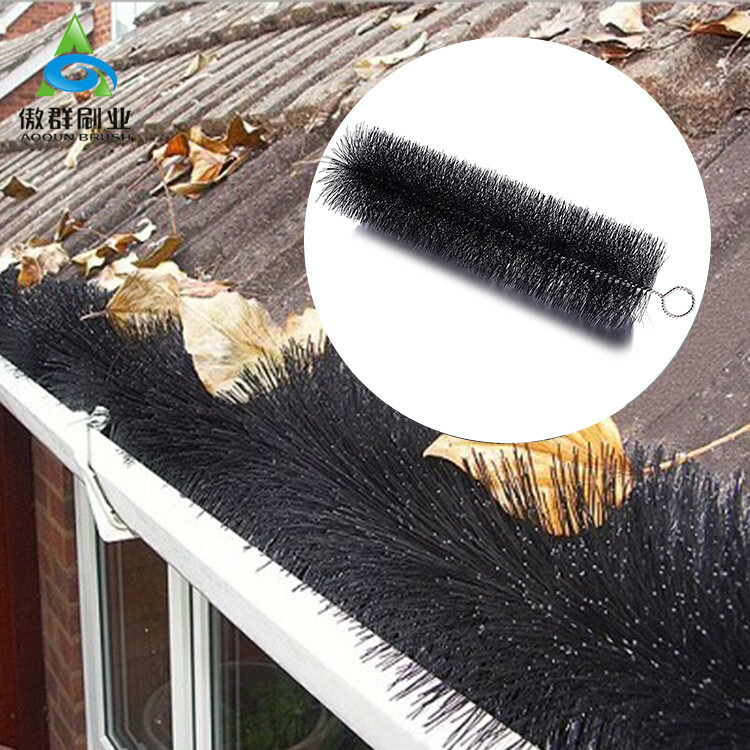 The roof gutter is clogged by waste water The Magical Effect of The Gutter Worm Brush: 1. Keeps gutters flowing to prevent clogged gutters and water damage 2. Helps prevent icicles and ice dams, protec our personal safety 3. Reduces or eliminates dangerous, messy, expensive gutter cleaning AOQUN can customize all kinds of gutter worm brushes and provide the installtion guideline for you. AOQUN is the confidence assurance for your purchasing brushes with us.